It can be a leap of faith to buy footballs online without first trying them. Fortunately 5-a-side.com has sought out and reviewed what we think is a pretty good mid-level football, which can be bought cheaply over the internet (at least for those of you within the UK). This football first came to our attention when we were browsing the sporting equipment department at Tesco. These stood out as by far the best footballs on offer. Impressed with what we saw, we decided to buy a few and road-test them for the website. We’ve been using them for over a month now in weekly 5-a-side football sessions and are ready to reveal our verdict. In short, this is a ball that we’ve found really good value for money and one of the best options out there at the price – both for quality and design. 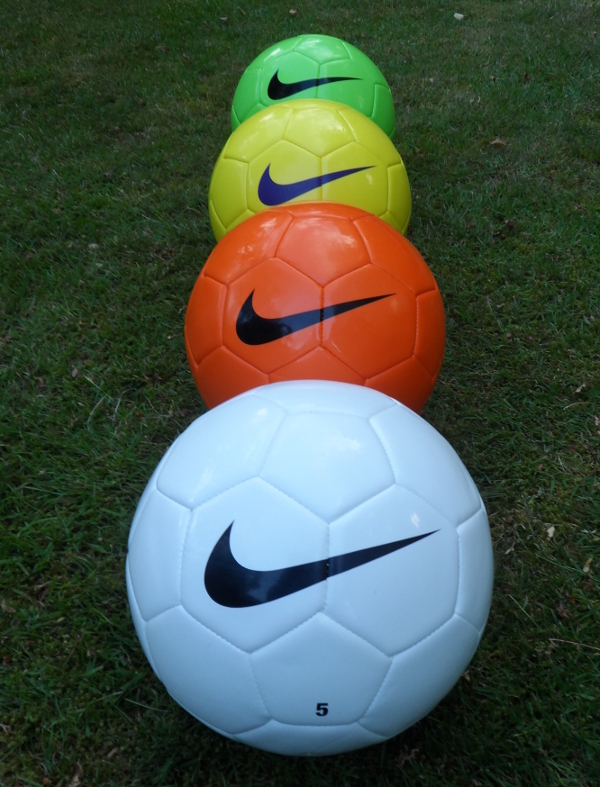 Tesco are charging a cool £10 a pop for each of these footballs, pretty good but not in the same league as online sports retailer Newitts who are selling them for a mighty impressive £7.68 a piece (at date last checked – 30th September 2013). It’s nicely put together with 32 panels (same as the official English Premier League ball for 2013/14). The design is clean and unfussy, with just the small Nike tick being put on one side – it feels reassuringly as though the manufacturers have concentrated on just making a decent ball, using good materials, and putting it together properly rather than going big on design gimmicks. Simple design, vibrant colours, good quality panels and stitching. It’s advertised as being a hand-stitched grained PU cover with Geo Balance technology – which Nike claims to assure equalized pressure dispersion for consistent response and ball flight. It looks round to us and certainly hasn’t shown any dodgy flight patterns when being kicked. After 4 weeks of competitive use on rubber-crumb artificial turf we’ve not noticed any deterioration in the stitching or any panels beginning to come off. It looks as though it will hold up well over time, though we don’t think it would stand up well to being played on rough concrete surfaces. The first think you’ll notice about the ball is that’s it has a lot of grip on it, especially when it’s brand new. Although that grip will gradually diminish over time, it’s nice to have a ball that’s not likely to slip out of your control when you’re trying to execute your skills. The PU panels are well put together and are slightly cushioned so that it gives a more comfortable, more expensive feel, making it a nice ball to strike. You won’t get any of the stinging toes that you can get on a cheap and cheerful ball from the sportsdirect.com bargain bucket. The weight of the ball also feels spot on, neither too heavy nor too light. It comes in four different colours: white, yellow (‘fluorescent’), orange and green. It also comes in sizes 5, 4, and 3. We bought four size 5 balls and a size 3 ball from Newitts . 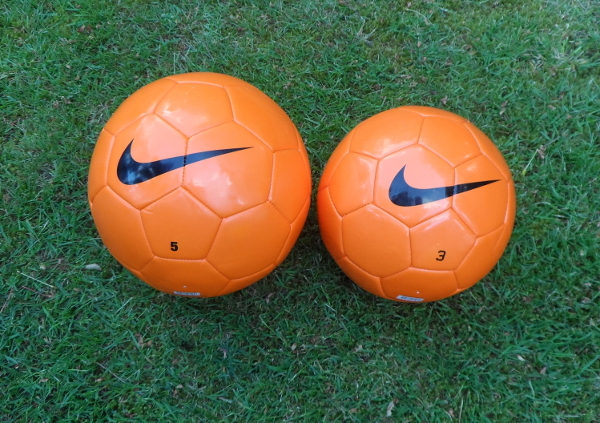 The size 3 compares equally well to the larger ball in terms of quality and feel, and has gone down a treat with the 9-year old we gave it to who especially loved the bright orange colour. 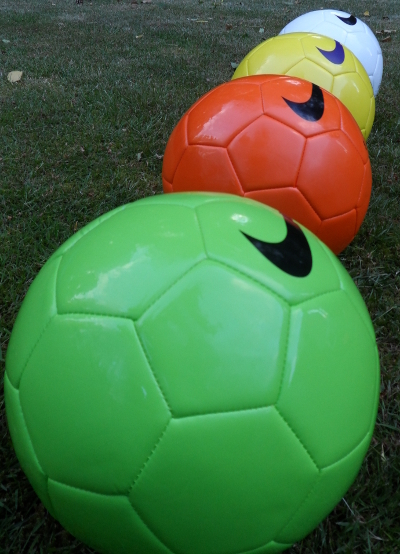 In fact, these balls have received great comments from coaches who seem to have ordered several of these in different colours, allowing them to use the different colours in developing different training games. The size 3 is just as good as the size 5, making this an excellent trainer ball for kids and their coaches. With a simple, unfussy design and a quality feel associated with more expensive footballs, we recommend this ball as a great practice ball (and even match ball) for both grass and artificial turf. In our view, in the sub-£10 price bracket there can’t be many better balls around for the price.